Hong Kong is a city of views. Upon arriving in Hong Kong one is assaulted with the image of the famous skyline. This commanding perspective offers a view of the top both literally and figuratively, if we also consider that much of that skyline represents the global circulation of things and money. Populated with 294 buildings over 150m tall (35-40 floors), and 2,354 buildings over 100m tall (New York only has 794), the city handily wins as being the place with the most opportunity to look down from above. But what do you see when you look down? In her book, The Global City, written in the early 1990’s, sociologist Saskia Sassen pointed out that global cities are as much about the office cleaners, secretaries, care workers, restaurant waiters, and refuse collectors as they are about the flows of money that go through them. Indeed, without such people doing this work, the city would soon come to a halt. Hong Kong is certainly not an exception. When one pauses to look, the activity of these people comes into sharp focus. There are, for example over 164,000 refuse workers in the city according to the 2011 census. Of these nearly 30,000 are over the retirement age (in Hong Kong retirement age is 60). Beyond that there are also uncounted numbers of elderly people who collect cardboard boxes and other recyclable paper, such as the woman pictured above. The wealthy look out from the widows of the skyline as they dine at Michelin stared restaurants (Hong Kong has 4 three star and 13 two star restaurants), spending on a single entry what this woman will earn after 3 or 4 days of collecting boxes (assuming HK$70 per kilo or about HK$200/day, see also this entry in the Fragrant Harbour blog and this statement from the current government). While the view from above is one of economic security and the affordances of excess, it is those who are economically at the bottom who eek out their lives by collecting, re-using, and remaking that excess. Hong Kong has a very limited social support system largely because it also has a very low tax rate. The result is inadequate care facilities for the very old, the waiting list is currently estimated to be 50 years for subsidised care homes (SCMP). Hong Kong is also a city with higher than average suicide rates (18.6 per 100,000 compared to the global rate of 15 per 100,000), but the rates for elders (those over 65) committing suicide are staggering at 27.6 per 100,000 population (Tam and Chiu 2011). Thus is it not just the view but also what we see that is important. Hong Kong, like many cities, in the construction of its image aims to focus attention on success, opulence and the benefits of freedom (Edward Snowden was certainly fooled). As the view is refocused, however, the values of the city are revealed in the image of below. 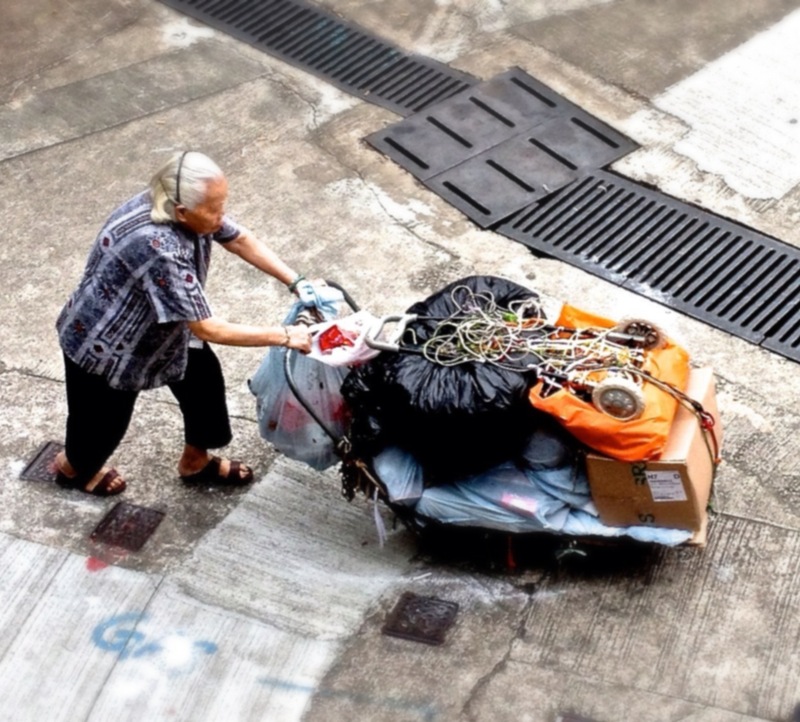 In my very first blog post I wrote about cardboard boxes and their importance in the lives of the elderly poor in Hong Kong (you can find it here). There are further photographs in Sight Lines Gallery: Every Day Lives of the Elderly. Sasson’s book, The Global City, is available on Amazon.co.uk and Amazon.com. This post is written in response to WordPress’ Weekly Photo Challenge. The theme this week is The World Through Your Eyes. The challenge was inspired by this post by professional photographer Ming Thein. This entry was posted in Elderly Hong Kong, Hong Kong, Social Positions and tagged elderly, Global City, Hong Kong, neoliberalism, postaday, poverty, Saskia Sassen, Weekly Photo Challenge: The world through your eyes by geofoodie. Bookmark the permalink. just watching Rick Stein’s Indian cooking programme and it’s sorta’ similar. Wonderful colour, vibrancy, street food and at the same time people living on the street. I think you combined theme and blog well.